The transitional period in Syria must occur under the current constitution and include a national unity government comprising various political forces, Syrian President Bashar Assad told Sputnik news agency. Terrorism in Syria and Iraq is receiving direct support from Turkey, Saudi Arabia, France and the United Kingdom, Syrian President Bashar Assad told Sputnik. "Terrorism — that’s the real problem. We must fight it on the international level, because terrorism affects not only Syria. Terrorism exists in Iraq. It is directly supported by Turkey. It is directly supported by the ruling royal family of Saudi Arabia, as well as a number of Western states, especially France and the United Kingdom," Assad said. "As far as other states go, they are watching, observing. No serious work on this issue is being conducted from their side. I think that with regard to this questions, the problem far larger than the problem of the actual figures," he added. Syrian refugees will begin returning home when they see hope for improvement, Syrian President Bashar Assad told Sputnik. "We’ve started infrastructure reconstruction work before the crisis is over, to soften, as much as possible, the influence of economic losses and infrastructure damage on the Syrian people and at the same time reduce the migration flow out of the country," Assad said. "Maybe some will want to return when they see that there is hope for the amelioration of the situation," he added. The president noted that the cause of migration is not only terrorism and the security situation, but also the blockade and Western sanctions introduced against Syria. "Many people have left safe areas where there is no terrorism because of the life conditions. Citizens can no longer provide themselves with all that is necessary. So we, as a state, must take steps, at least the most basic ones, to improve the economic situation and the service sector in Syria. That’s what we are currently doing in terms of reconstruction," he stated. Damascus will lean primarily on Russia, China and Iran in rebuilding the country following the war, Syrian President Bashar Assad told Sputnik. "The reconstruction process is in any case profitable for companies that are participating in it, especially if they manage to get loans from the countries that will support them. Of course, we expect that the process will rely on the three main states that have supported Syria during this crisis — that’s Russia, China and Iran. But I suppose that a lot of countries that were against Syria, I mean first of all Western countries, will try to direct their companies to take part in this process. 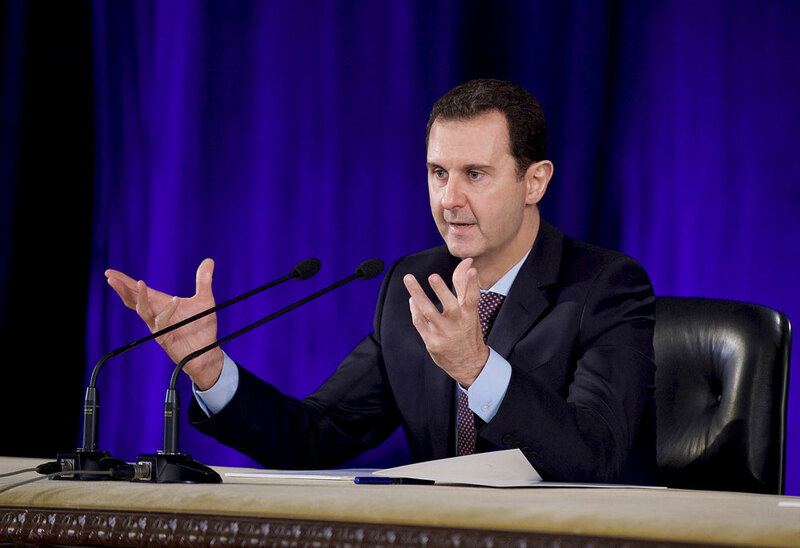 However, for us in Syria there is absolutely no doubt that we will ask, first of all, our friendly states," Assad said. According to the president, it is "absolutely certain that if you were to pose this question to any Syrian citizen, his answer, political and emotional, would be that we welcome, first of all, the companies from the three countries, primarily from Russia." "If we’re speaking of infrastructure, it spans, perhaps not even dozens, but hundreds of different areas and specializations. So I think that Russian companies will have a very broad space for contributing to the restoration of Syria," he added. The transitional period in Syria must occur under the current constitution and include a national unity government comprising various political forces, Syrian President Bashar Assad told Sputnik. "First of all, regarding the definition of the 'transitional period,' such a definition does not exist. We in Syria assume that the term political transition means the transition from one constitution to another, and a constitution is what defines the form of the needed political composition in the next stage. Thus, the transition period must be under the current constitution, and we will move on to the new constitution after the Syrian people vote for it," Assad said. "Before that, what we can work on, as we see it in Syria, is the government," he added. "This transitional structure or transitional format is a government formed by various Syrian political forces — opposition, independent, the current government and others." The unity government's main goal would be to work out a new constitution and let the Syrian people vote on it, after which a transition to the new constitution could take place, Assad explained. "Neither the Syrian constitution, nor the constitution of any other country in the world includes anything that is called a transitional body of power. It’s illogical and unconstitutional. What are the powers of this body? How will it govern the daily lives of citizens? Who will be assessing it? Today, there is the People’s Council [Syria’s parliament] and the constitution that regulates the work of the government and the state. That’s why a solution is a government of national unity that will prepare a new constitution," the president underlined.